Usually, the spoilt Parisian doesn’t think about it. Water comes out of the tab. That’s it. 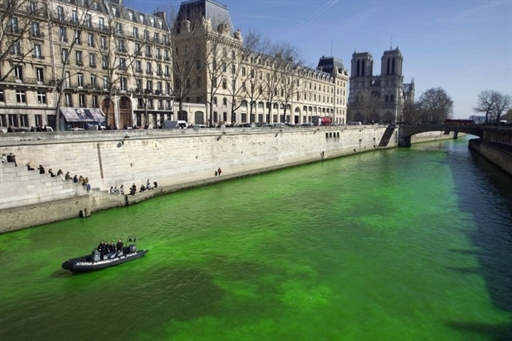 But this was en eye-catcher: the Seine tinted completely green. And what a green. The picture above was taken yesterday, on March 22, the World Water Day. Environment activists had tiped a fluorescent product in the water, although making sure that it was a completely biodegradable product. This was just to remind us that the Parisians use too much water. Although I have to say that the Americans are worse. They use 159 gallons, an equivalent of 600 litres. For the sake of justice I have to say that Parisians don’t have a lot of cornfields to water. They just shower in the morning, they flush the toilet with drinking water, they wash the dishes and the clothes with drinking water, and after a bad-hair-day they might wash their hair a second time in the evening - with drinking water. Not every one can use several bottles of Evian like Claudia Schiffer to make sure that her hair will be glossy.